The Original Wheelgirl: Happy Mother's Day! Happy Mother's Day to all the moms out there! This year I gave my mom a gold bangle bracelet, and I made a gift bag out of Certainly Celery cardstock using the pattern that was in PaperCrafts magazine a while back and was also Technique Challenge #102. 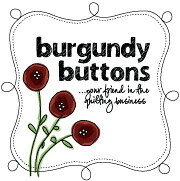 The center panel uses one of the green papers from the Palette O' Prints pack available now from Stampin' Up. I used brown grosgrain ribbon I got at Michael's for the handles and attached it with Sticky Strip to make sure it stuck. The bag was also put together with the same sticky tape. I was happy to see I had matching green brads to add to the top of the bag on the ribbon! I made a matching card using the same colors and paper and the Sketch Challenge 105 (one of my favorites! ), with a bit of Chocolate Chip cardstock for the matting. 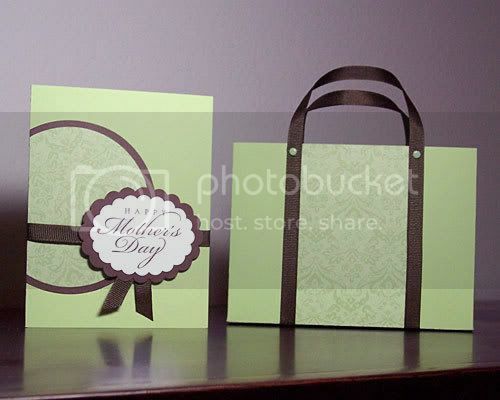 I used the Happy Mother's Day stamp from All Year Cheer II (too bad its retiring) in Chocolate Chip ink on Whisper White cardstock and punched it out with my Mega scallop oval punch and matted it in Chocolate Chip with the Giga scallop oval. Mom was thrilled!